Many companies who used to use BusinessVision (BV) to process payroll will be switching to BVEssentials (BVE) payroll in January 2016. This article will clarify some of the details involved with this transition. It is important to understand that BVEssentials uses the same payroll files as BusinessVision; some functions such as the Payroll Year End are still handled by BV while payroll processing is done in BVE. The following should be done AFTER the last pay in 2015. You should be running BVE version 6.5.47 or above. If you print cheques, ensure also that your BVE payroll cheque has been customized to fit your cheque and window envelope. 1. Ensure all users are out of BV and BVE. Make a backup of your data. 2. Perform the payroll year end in BV. 3. 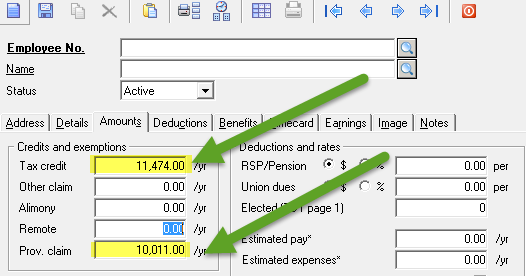 In either BV or BVE, update the Tax Credit and Provincial Amount in Amounts tab of each employee. The Tax Credit for 2016 is $11,474; the Ontario claim is $10,011. a. Set all Pay Periods to 0.
b. Set the Next payslip No. ONLY if your payroll cheque sequence is separate from your normal cheque sequence. c. The Pay date will not be used by BVEssentials. d. By default, the Period is not used anywhere and will not print anywhere. It can be filled in and added to the payroll cheque only if desired. 2. 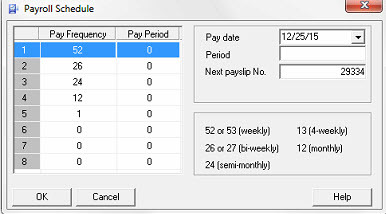 In BVE, in Payroll, on the Timecards Tab, click on the New button to add a new batch. 3. Set the Payroll Date. BVE will automatically use the correct payroll tables based on the date entered and will also select the correct Pay Period. 4. Click on Add All Timecards, which will add a timecard for each active employee. You will see that the Salary for all salaried employees is already filled in. 5. For each hourly employee, click on the employee on the top half of the screen and enter their hours on the bottom half of the screen. 6. Delete any timecards for employees who are not being paid. 7. Once you have entered all of the payroll information, click on Post Timecards. You can post all or selected ones. Note that the Cheque Number and Transaction Number are now filled in. 8. You will be presented with the BVE Reports screen listing the various cheque formats available to you, including a customized format should you have one. Print the format of the paycheque you require. Ensure that the printer is loaded with payroll cheques, starting with the first number that is listed on the Timecard screen. After your last pay in the CRA payroll reporting periods, in BusinessVision, run the Receiver General report to calculate your remittance. If you require paycheque report customization, please contact me at rita.bloem@rogers.com. This entry was posted in BVEssentials and tagged 2016, BusinessVision, BVEssentials, Payroll by InSpired Consulting Services. Bookmark the permalink.